Where do I use my The Jewellery Channel voucher code? Find the discount you want to use from NetVoucherCodes and follow the link through to The Jewellery Channel. Add items to your online basket. View your shopping bag and insert your code into the ‘Enter Voucher Code’ Box. You will need to create an account or continue as a guest to complete your order. 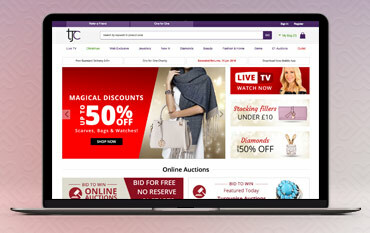 Broadcasting to 30 million homes across the UK and Ireland, The Jewellery Channel brings amazing offers on beautiful adornments direct to your living room - and now with The Jewellery Channel’s online service, you can benefit from the same excellent prices and exciting auctions without even turning on the TV. Our The Jewellery Channel Discount Codes bring you added savings on their massive selection of necklaces, rings, watches, loose gems, gifts and more from the world’s top designers and also from TJC’s own unique brands, like Iliana, Rhapsody, J. Francis and Karis. Through the website, you can take part in thrilling online auctions as well as a wide array of fixed-price sales, including online-only offers, and the Personal Shopper service is there to help you enjoy the greatest shopping experience possible. Once you’ve made your choice from their impressive selection, there’s low-cost P&P and a 30-day money back guarantee in the rare event you’re not delighted with your new items. Find a piece of jewellery that you’ll instantly fall in love with, whether that be a contemporary pair of earrings, or something more traditional. No matter what you decide, discover something that will fit seamlessly into your jewellery box, with The Jewellery Channel! Explore true Italian jewellery styles with the Vicenza collection which incorporates beautiful shapes, stand-out designs and lustrous metals, to give your style a major boost in femininity and elegance. As well as this luxurious collection there's also other stunning collections and pieces, all available at great prices with major discounts. The Jewellery Channel is a British falling-price auction-style home shopping channel and online retailer specialising in jewellery and gemstones. Use one of our The Jewellery Channel voucher codes and you can save on affordable diamond, gold, silver, platinum jewellery with precious gemstones. The Jewellery Channel offers a wide range of beauty, fashion and lifestyle items with a 30-day money back guarantee.